Indianapolis is the 16th largest city in the U.S. and one of the Midwest’s famously friendly cities. The capital of Indiana, Indianapolis plays host to many conventions and sporting events, most notably the Indianapolis 500, the Indycar race held each year at the Indianapolis Motor Speedway. There are enough free and fun things to do in Indianapolis with kids to make it an affordable family vacation destination. Indianapolis has remade its downtown into a hub of activity. If you haven’t been in awhile, you might not recognize the city, and all the new fun things to do, including many free things to do with kids. Even some world class Indianapolis attractions offer free admission on certain days during the year. For example, the Indianapolis Zoo, which boasts the incredible International Orangutan Center, is free on Martin Luther King Jr. Day each year. Also free on MLK Day are the terrific Eiteljorg Museum of American Indians and Western Art and the Indiana State Museum. Hands down, this is one of the world’s best children’s museums. It offers free admission each year on Martin Luther King Jr. Day, Presidents Day and Christmas Eve. On the first Thursday of each month, admission is a discounted $5 from 4-8pm. Buy your tickets online before you go to ensure you get a spot before it sells out. As an added bonus, parking at the museum is always free. This glass-enclosed structure attached to Circle Centre Mall hosts more than 300 free activities, including dance performances, storytelling, visual art exhibits, musical performances, films, lectures, readings, fairs, and festivals. The Artsgarden also houses the Cultural Concierge, a centralized source for free maps, ticket information, visitor guides, and directions for Indianapolis arts events. This seven-story-tall glass structure is suspended 17 feet above the intersection of Washington and Illinois streets. 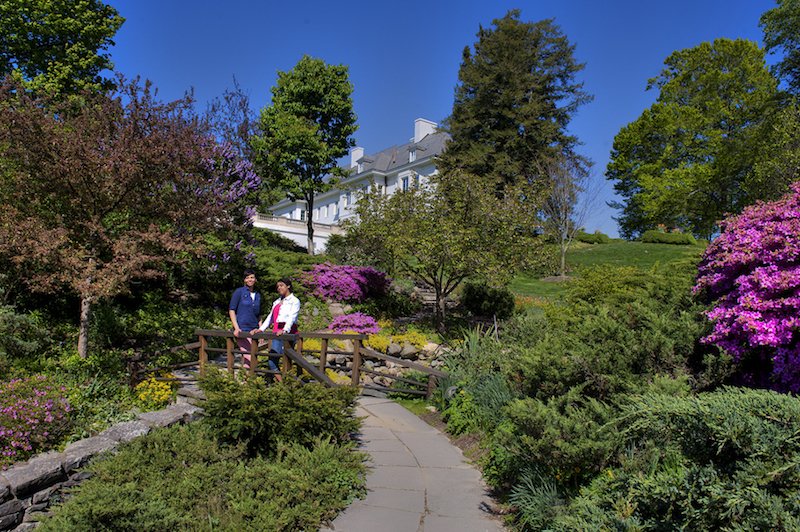 Don’t miss a chance to stroll through. Even if there is no performance, it’s a peaceful spot to rest during a busy day exploring the city. Home to many local artists, this center houses eight exhibition spaces, 13 state-of-the-art studios, a 224-seat auditorium, a library, a gift shop, a riverfront deck and stage, and sculpture gardens along the White River. The building itself is a work of art, designed by world-renowned architect Michael Graves. The Philharmonic Orchestra of Indianapolis and Indy Parks present free Pops concerts every summer. The concerts include a mix of patriotic songs, jazz, light classical, movie themes and operetta. All concerts begin at 7 pm and parking is free. Indianapolis Concerts on the Canal are offered on Thursday nights from 6-8pm throughout the summer with free seating on the grass. Bring a lawn chair or blanket and a picnic dinner to keep the event free. Or buy food from the Stardust Terrace Café. This public market offers free concerts on the first Friday of the month and hosts a farmers market on Wednesday mornings from May through October. Read more: A weekend guide to visit Indy with kids. The 8-mile $63 million Cultural Trail in downtown Indianapolis connects the city’s Cultural Districts. It’s a great way to explore the city. As a bonus, it’s flanked with $26 million in public art. 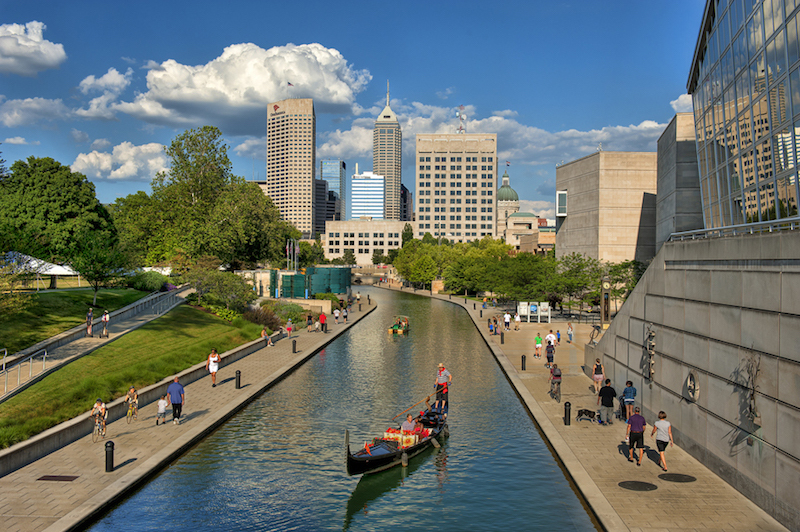 Or just take a stroll along the 3-mile Canal Walk in downtown Indy. Download this file for a self-guided tour before you go. Many of Indy’s monuments and memorials to fallen veterans are free. The USS Indianapolis was one of the worst at-sea naval disasters in history. But it also played a pivotal role at the end of World War II; it was the last U.S. ship to sink. Visit the memorial, on the east bank of the Central Canal downtown. At the Indiana World War Memorial, step inside the Shrine Room. It’s stunning and emotional, packed with incredible stories and history. Start the day with Sunrise Yoga on the Canal. Bring your own yoga mat. Parking is free until 7am. Or, if you prefer a later day workout, choose the cardio and interval training class at noon on Wednesdays. Classes are offered throughout the summer. Sitting on Monument Circle, the Soldiers and Sailors Monument is Indiana’s official memorial to the Hoosiers that served in the Revolutionary War, the War of 1812, the Mexican War, the Civil War, the Frontier Wars and the Spanish-American War. It stands 284 feet, 6 inches high, only 15 feet shorter than the Statue of Liberty. The observation deck at the top offers 360-degree views of the city skyline from 275 feet up. Getting to the top is free if you’re willing and able to climb the 331 steps. If you prefer a ride, spend $2 to take the elevator most of the way, and then climb the final 31 steps. The elevator ride is free for veterans. The Monument is closed on all national and state holidays except for Memorial Day and Veterans Day. The Colonel Eli Lilly Civil War Museum on the lower level of the Soldiers and Sailors Monument explores the impact of the Civil War on the people of Indiana. Rolls-Royce Heritage Trust Allison Branch is responsible for maintaining and promoting all aspects of the rich heritage of Allison, which became part of Rolls-Royce in 1995. It includes an extensive collection of aircraft engines made by Rolls-Royce and USA predecessor Allison Engine Company. The Benjamin Harrison Presidential Site, which was home to the 23rd President of the United States and the only president to hail from Indiana, offers free tours and birthday cake on Benjamin Harrison’s birthday, August 20. The tour covers three floors and 10 rooms of the house and includes a nationally significant collection of more than 10,000 artifacts. More than three-quarters of the objects on display are original to the Harrison family. The home also features The President’s Theatre, a spot that is frequently used for theatrical performances and events. While the museum itself is no longer free, its 100 Acres: Art and Nature Park at Newfields still is. Pack a picnic and let the kids run while you enjoy the scenery and large-scale quirky art installments. Funky Bones is probably the most famous piece inside the Park. It was featured in the New York Times Bestseller, The Fault in Our Stars, which was later turned into a movie. 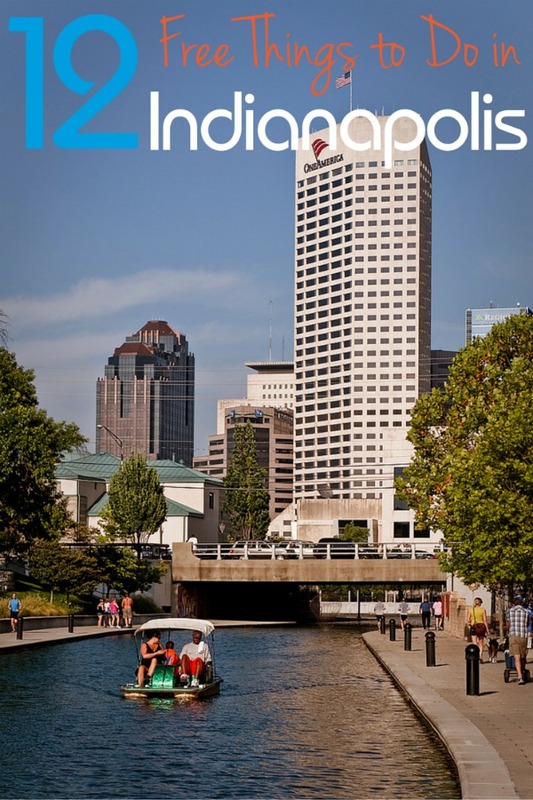 What are your favorite free things to do in Indianapolis with kids? Share with us in the comment section below. Next Post: What Does Travel Insurance Cover? 8 Surprising Things It Includes! 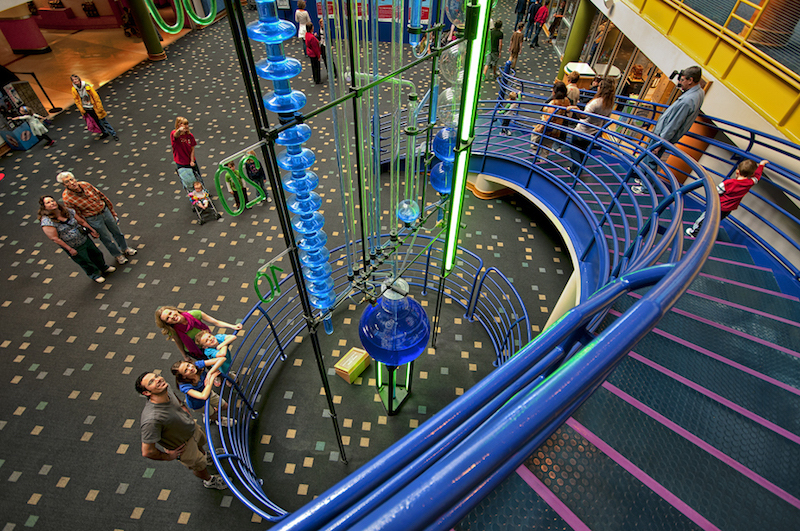 Just to add a bit about the Children’s Museum of Indianapolis…it is amazing! With kids, it is really an all-day event. Certainly one of the best kids museum’s we have been to. I had not heard of the Garfield Park Conservatory, but I think we will check it out on our next trip. Reminder: Garfield Park is on the south side of Indy. Well within the city limits but outside of downtown. It’s in the neighborhood if you know what I mean. Actually Garfield park is in a great neighborhood all around the park especially on the conservatory side but like any other city if you get a mile or so in each direction it gets a little shady but hey poor people and drug dealer’s have to have a place to call home also.. I would say the Conservatory and flower garden is one of Indys best kept hidden secrets and it’s really worth your time and effort to check out and actually the entire Garfield park is a beautiful place to see especially on a sunny and cool day and if you can get there around around March (I believe) they have one of the most beautiful Tulip garden’s that you will ever see. I would actually suggest Crown Hill Cemetery just south of 38th St., east of Martin Luther King Jr. Blvd., west of Boulevard Place and north of 32nd St. It’s also outside of downtown in the neighborhood but well patrolled by both police and cemetery staff. Inside are the graves of John Dillinger, LS Ayres, Robert Irsay (father of and one time Colts owner), James Whitcomb Riley, Richard Gatling (inventor of the Gatling gun), Col. Eli Lilly, President Benjamin Harrison, Indiana Governor Robert Orr, Indiana Civil War Governor Oliver P. Morton, a confederate grave yard for Civil War prisoners, a graveyard for deceased soldiers from all American wars, a police and firemen’s honored dead who died in the line of duty, Edward “Cannonball” Baker (early Indy car driver), US Senator Albert J. Beveridge 1899-1911 etc. etc. etc. That’s pretty cool. I had no idea! Cemeteries are underappreciated tourist sites. There are deer living in there too. I’ve seen them a few times, when going by. Gold standard Children’s Museum; I often compare others to this one. Love the Indianapolis neighborhoods/districts. Just as an update – the Indianapolis Museum of Art no longer has free admission daily. There are a handful of free days during the year, but there is a charge most days. We’re super excited to visit next month. Can’t wait to explore all these cool sights! 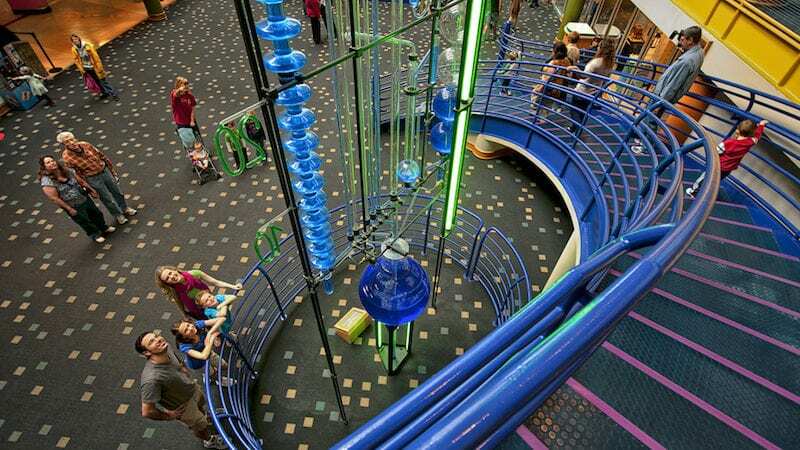 Update: The Children’s Museum is now $5 per person on the first Thursday night of each month. Not free, but still a deep discount. 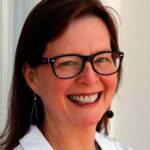 Great tips on other places to check out! Thank you! Thanks for all the great suggestions! I have never been to Indiana before, but I will definitely bookmark this page to revisit when I do visit. I didn’t realize Indiana had so many kid friendly activities! Thanks for sharing! Taking children on an overnight trip downtown is a great way for to learn about where they live and the varieties of interesting and things that are there. Like the Farmers Market, the State Capital Building, and other fine landmarks and historical treasures. As well as the many nice modern attractions. Take them for a ride on the city bus. Go for short walk around your hotel at night. Let them see the lights and experience a little of the night life of the city. They can learn so much and will have a great time doing so. The NAMOS was free at IUPUI but is now being moved to The Children’s Museum’s Sports Legends Experience Exhibit which has a cost. This is such a beautiful place. I love strolling around War Memorials. It’s relaxing. I love to walk around and just chill at the War Memorials. A relaxing place.